What does it mean to be a Standards Developer or SDO? Becoming an accredited Standards Developing/Development Organization (SDO) means that the process and steps performed by the PDA meet the guidelines set forth by the American National Standards Institute (ANSI) in the ANSI Essential Requirements: Due Process Requirements for American National Standards (http://www.ansi.org/essentialrequirements). The key elements include openness, consensus vote, due process, lack of dominance, balance, public review/consideration of views and objections, an appeals process, and compliance with the ANS policies and administrative procedures. Standards are voluntary agreements, developed within an open process that gives all stakeholders, including consumers and subject matter experts, the opportunity to express their views and have those views considered. A standard is a document that tells you how to do or say or make or test something. An agreed-upon way of doing something. What is an American National Standard (ANS)? An American National Standard (ANS) is a voluntary consensus standard developed in accordance with the American National Standards Institutes(ANSI) Essential Requirements and is subject to ANSI’s unique: (a) accreditation of applicable procedures; (b) neutral oversight; (c) document approval process; (d) appeals process; and (e) audit. Who and what is ANSI? ANSI stands for American Nation Standards Institute. ANSI facilitates the development of American National Standards (ANS) by accrediting the procedures of standards developing organizations (SDOs). Founded in 1918, ANSI is a private, non-profit organization (5013c). ANSI coordinates standards, conformity assessment, and related activities in the U.S, and they are the official U.S. representative to the International Organization for Standardization (ISO). Why did the PDA become a standards developer? PDA Technical Reports are often used as a point of reference for regulatory compliance and inspections; ANSI accreditation provides access to other member benefits - ISO TAG Administration, U.S. Technical Advisory Group (TAG) for ISO standards activities for example; and becoming a standards developer adds value to the PDA brand name. 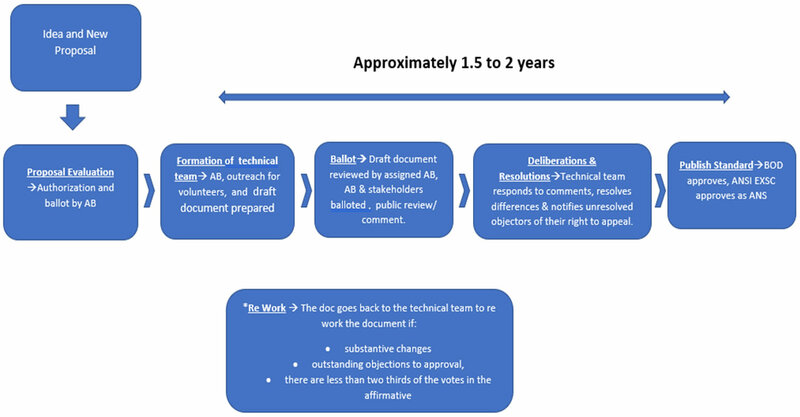 How does the PDA Standards Development Process work, and What is a typical time frame for developing a consensus standard? Where do the ideas come from for a standard and How do I recommend a standard for development? Ideas/New proposal can come from anyone and anywhere, and may include PDA technical reports for standard development. How can I learn more about the PDA Standards Development Process? To Learn more, visit or contact.